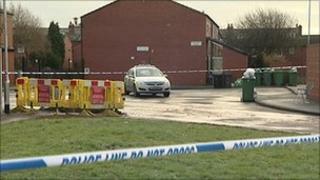 Gas canisters which caused an explosion at a house in Leeds were being used to produce cannabis resin, police believe. A 36-year-old man and a 15-year-old boy suffered burns in the blast at a mid-terrace house in Aysgarth Place, Richmond Hill, on Saturday. West Yorkshire Police said the source of the fire had been traced to the kitchen, where several butane gas canisters and cannabis were recovered. The 36-year-old man, who remains in hospital, has been arrested. The 15-year-old boy has been discharged from hospital. Police said they also found a further 20 butane canisters in a shed at the back of the house. Det Insp Paul Conroy said: "We are extremely fortunate there were no fatalities to anyone either in the house where the explosion took place or the surrounding properties. "The use of this highly-flammable material in a domestic property is extremely dangerous and has put a number of people's lives in danger."